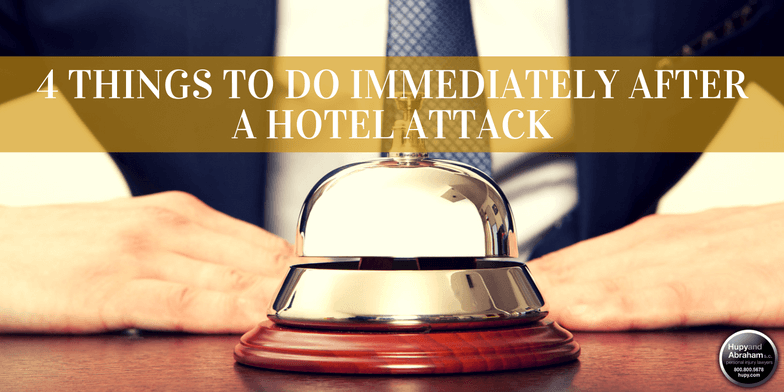 What to Do Immediately After a Hotel Attack | Hupy and Abraham, S.C. Whether you were traveling for business or pleasure, your hotel was supposed to be your home away from home. It was supposed to be peaceful and comfortable. Even travelers with the very lowest expectations of comfort or elegance count on their hotel being safe. However, it was at your hotel where you were hurt. It was in the hallway, stairwell, exercise room, pool, private room, or in another part of the facility that you were attacked and injured. It was a situation that you never expected and one that you have no idea how to recover from. Get medical attention. Do not self-diagnose your injuries and do not delay getting immediate medical treatment. Not only can doctors treat your immediate pain, but they may also be able to help you keep your injuries from getting worse. Report the incident to the hotel manager. All that you have to do is to tell hotel personnel where you were when you were hurt, approximately what time you were hurt, and provide a description of who attacked you. You do not have to give a recorded statement, nor do you have to speak with insurance adjusters or insurance lawyers. Call the police. A criminal act should be reported and investigated. Call a lawyer. An attorney can make sure that your rights and possible recovery are protected. A lawyer can also advise you about what to do next so that you don’t have to worry about making the right decisions. These things will happen at different times for different people. If you are conscious immediately following the attack, then you may be able to do some of these things in the minutes after your attack. In other cases, these things may happen hours or even days after your attack. The important thing is that you take these actions as soon as you can to protect your recovery. Hotels have the obligation to provide a secure place for their guests. When the hotel’s management fails in that obligation, people are hurt…sometimes gravely, even fatally. Defective locks. Hotels often skimp on certain things they think may save them money. Unfortunately, this may include not fixing or replacing old or damaged locks. Lack of security personnel. In an effort to provide its guests with safety, a hotel may need the presence of a security guard or doorman. Failing to provide security guards may result in a criminal walking straight to your room without hesitation. Lack of lighting. Criminals love to lurk in dark and shady places. Gloom gives them the cover they need to wait for their victim to cross their path. Hotels that have areas with low light or no light at all are putting their guests at risk. While a criminal may also be at fault for your injuries, the lack of reasonable security by the hotel may have also contributed to your injuries and the hotel may be responsible for paying your damages. You are in a situation that you couldn’t prepare for or predict. However, you can prepare for your recovery if you are hurt at a hotel or another common location for a negligent security incident. You can get started right now by reading our FREE report, Negligent Security: What You Need to Know About It, and by starting a free chat with us today.